Scared Stitchless: My fabric has a new home - a peek in my sewing room! My fabric has a new home - a peek in my sewing room! Last weekend I painted this tallboy so I could put it into my sewing room to hold all my fabric and patterns. We had teal paint leftover from painting the Dining Room and I love all the colourful tallboys and dressers I keep seeing on Pinterest. While it took me most of my sunday to sand this down and paint the inside and outside with 2 coats plus an extra coat on the top surface it was well worth the effort! Here it is in place in my sewing room holding my machines. It doesn't have handles yet because I've never loved the handles that came with it and I can't bring myself to put them back on. 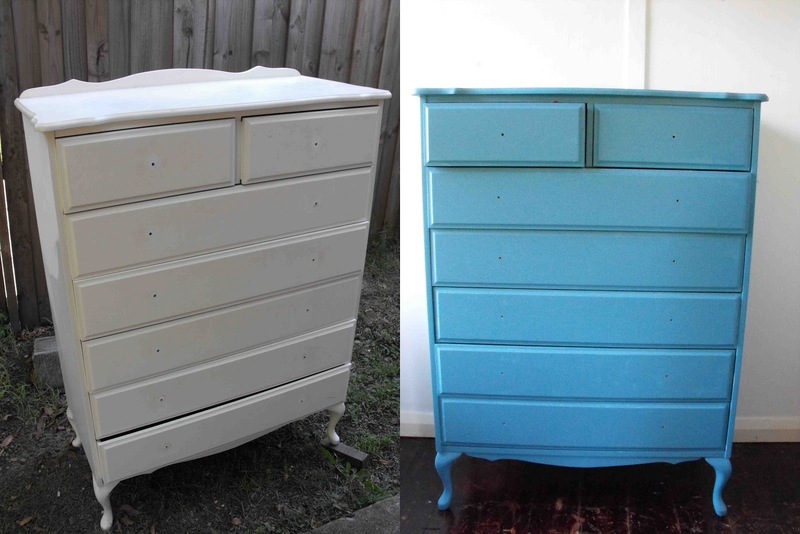 I'm going to get little round wooden handles from Bunnings and maybe paint them black? Or maybe just keep them teal? What do you think? So while we're in my sewing room want to look around? I've moved my table over into the corner so I get the morning and afternoon light through either sets of windows. And I have all my notions and books stored against the other wall lookin all neat and tidy. And here's a pretty average photograph of one of my next projects. I've enrolled in a short course on upholstery so I'll be taking this chair apart and redoing it in some fabric that goes with my sewing room. What a pretty color, it feels great to have your room all organised doesn't it. Do i spy a work in progress on your table? Yep I love it, it's my happy place. Yes there's a few works in progress in these shots actually. But the one on my table is my favourite and almost finished. Hopefully it'll be up next week! Looks great Jodie. For the tall boy why don't you get glass or crystal knobs, they would look lovely against the teal! Ooh glass or crystal knobs! What a fab idea that would look amazing, thanks for the idea! How about one of these two ideas for your handles? You probably have most of the supplies needed to make both! They're both cute! Man you guys are a lot more creative than I am. I really need to think this handle thing through. Yeah that idea is winning so far! Yep I'm going to see where I can source some nice glass/crystal knobs from, thanks for the advice! Thank you, it's a really nice place to escape to! Thanks! I'm still deciding exactly what fabric to use but I'm really looking forward to the classes! 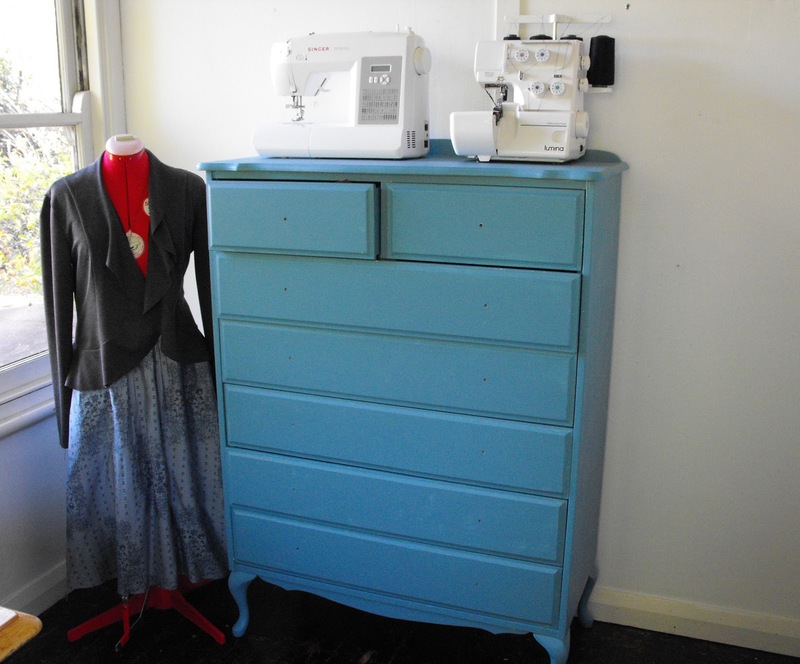 Gorgeous sewing room and love the tallboy. The glass/crystal handles sound gorgeous but then the two pinterest items were cute as well. Yeah here I was deliberating whether to go black or teal. I feel like this decision got a lot harder (but more awesome) after everyone piped in. Aww, well I've been sewing for 3 years and I've had this little sewing room for about 4 months now so I think I waited long enough for mine! And now I never want to give it up! I've seen really cool images of 1 handle in a bright contrast colour like coral as a cute feature if you're brave enough. The teal looks great though, well worth the effort. Ooh that sounds kind of awesome. I'm not sure if I'm brave enough but I haven't bought anything yet so I'll see what I can find. You have awesome lighting and a view in your new sewing space. I'm super jealous! Yeah I'm very lucky to have tons of natural light in the sewing room. Our whole house is a bit that way - tons of windows! Which is really only a problem when it comes to buying curtains. Thanks, yeah I love being surrounded by bush. I never get enough of the view out the window. lovely. i was going to suggest crystal knobs too. what a lovely colour and space! Yep crystal knobs are stilling winning with everyone involved in the discussion. Thanks! I personally recommend this product or the octagonal ones. They look great in our house and you can usually find them cheaper than schots have them, although I don't think bunnings has any. Try mitre 10s or a local hardware store! Thanks Kat! I'll check it out. Amazing room, simple but complete. but hey, thank you for this amazing space.